Be the first to share your favorite memory, photo or story of Patricia . This memorial page is dedicated for family, friends and future generations to celebrate the life of their loved one. 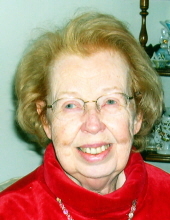 CARBONDALE - Patricia Elise (Clapper) Hungerford, 92, of Carbondale, passed away in Herrin Hospital on Thursday afternoon, January 24, 2019, with her daughter by her side. Patricia was born in DeKalb, Illinois, on August 18, 1926 to Jay T. Clapper and Elsie C. (Anderson) Clapper. At the age of 20, Patricia graduated with a Bachelor of Science degree from Northern Illinois University. She went on to teach school in northern Illinois, including in Kankakee, where she met her husband, Harold R. Hungerford of Momence, Illinois. She and Harold had two daughters, Linda and Suzanne. They relocated to Carbondale in 1965. In 1971 Patricia also earned a Master of Science in Education degree from Southern Illinois University. Patricia was a mother, teacher, and homemaker. She was accomplished in sewing, cooking, and gardening. She was an active member of the Women’s Club, the Carbondale Garden Club, and the Orchid Club. She was an extraordinary orchid grower, earning many awards in orchid shows. She also enjoyed reading and loved to travel. She enjoyed trips to England, Belgium, Switzerland, Norway, Sweden, Costa Rica, and Canada. She was a wonderful mother to her daughters, and brought much beauty into the world. She was loved by her family, friends, and caregivers. She is survived by her husband, Dr. Harold R. Hungerford of Carbondale, her daughter, Dr. Linda Hungerford, of Sumner, IL, her daughter, Dr. Suzanne Hungerford, of Morrisonville, NY, and her son-in-law, Dr. Patrick Coppens, of Morrisonville, NY. A celebration of her life will take place on Tuesday, January 29 from 5:00 to 7:00 PM at Meredith Funeral Home in Carbondale. To send flowers or a remembrance gift to the family of Patricia Elise Hungerford, please visit our Tribute Store. "Email Address" would like to share the life celebration of Patricia Elise Hungerford. Click on the "link" to go to share a favorite memory or leave a condolence message for the family.